My first year to participate in a Me-Made-May, it was exciting to really 'think' about what I wanted to wear for this May Day. I chose a couple of things I made last year, when I first began sewing clothes for myself. I've never worn the ruffled sleeveless draped top in public as it seemed a little 'over the top' somehow, but coupled with this rtw black cardi, it toned all the ruffledness and pinkness down... some. Also a new belt helped pull this outfit together. I love this belt and am finding I reach for it a lot. It was recently purchased at our local Wal-Mart for $8.00. Thought I'd include this shady photograph too, as it shows the colors of the skirt better. The fabric for the skirt and ruffled top were both purchased at Hobby Lobby and looks like both are still available. Both were made from NEWLOOK 6108, which was a perfect beginner project to jump-start sewing for myself. I've sewn a lot through the years, but not for myself.... for some reason. My notes written at the original post review the easiness of the construction. What's interesting is that if I were to see this fabric today, I'm not sure I'd buy it as I'm naturally more drawn to nature's color palette. Growing up, my mother, who loved all things bright and colorful coupled with very large pieces of jewelry, would get a little put out with me as I tended to choose the browns. She made a lot of my clothes back then and it probably really bugged her to buy 'brown'-themed and muted colored fabrics for me! I think I was thinking more of her last year when I bought these fabrics as she'd recently passed away. This is how I wore it to have lunch with a friend last year showing how it was accessorized a little differently than today. After I post this, I am heading out to the grocery store and feel great wearing my Me-Made outfit, with the ruffled top finally getting a little attention out of my closet. And can I say how thrilled I am to be able to participate in a Me-Made-May! Still don't have a vast quantity of me-mades, but just to even think I'd be able to participate, even on a small and humble scale, is quite exciting to me! You're lucky to have such a sunny, spring day to usher in the month and the MM part of it. Your floral skirt is perfect for May Day. I have overcast skies, cold winds and am clad in black tights - among other clothes too, of course! It has been a crazy weather season hasn't it?! Hopefully you'll feel 'Spring' your way soon Barbara. Your outfits both are so adorable. Really love the material you picked for the skirt. I actually have this pattern in my stash....so seeing yours is a good inspiration to get mine out, but just to find the right fabric in my stash. Thank you so much! 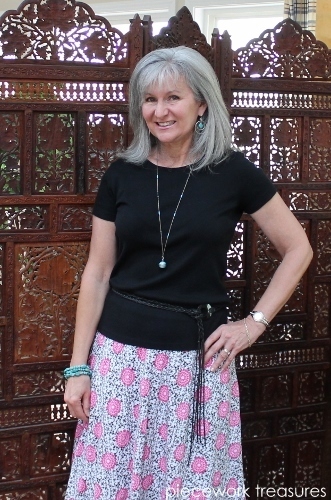 You will really like the skirt as it is such an easy sew for a nice, pretty "look". Oh, and it is very comfortable to wear too. Good Luck! Really like the skirt.. and the ruffle top is pretty too. Thank you Judy! It is really taking me some time to get used to the ruffled top, but did feel quite comfortable wearing it this way.